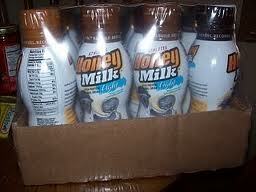 The peeps over at Athletes Honey Milk were sweet enough to send us an ENTIRE CASE of Honey Milk! I thought the BD would have a heart attack when he saw it! He loves this stuff! Honey Milk is a high-protein sport recovery drink, and meal replacement. It is also lactose free. It is supposed to improve your performance, increase endurance, and reduce muscle fatigue. Aside from all that, it's sooo good! It comes in five flavors: Vanilla, Honey, Acai-Pom, Chocolate and Coffee. Yum!! I hardly ever eat breakfast, and I have found that Honey Milk is a great meal replacement. It gives me that little boost that I need and keeps me from feeling like I am starving to death! My favorite flavor is Coffee, of course. I even had Tater drinking some of the Chocolate flavor the other day, when he didn't want to eat lunch! BD loves every flavor equally, and is being very protective of this case of Honey Milk that is in our house! As our family proves, you don't have to be an athlete to enjoy Athlete's Honey Milk! Get Your Own! To try your own Honey Milk, just click here. Love your posts! Following via Friendly Friday...hope you follow back! I have to try that one out. Honey milk, never heard of them before. Interesting. Thanks for sharing the reviw. I am your new follower and I will be visiting often to check for new blog posts. You can visit me at http://showmemama.blogspot.com. Please, leave a comment so I know you visited.